It's the most wonderful time of the year... Yes Christmas is here, and I am too excited by this fact. 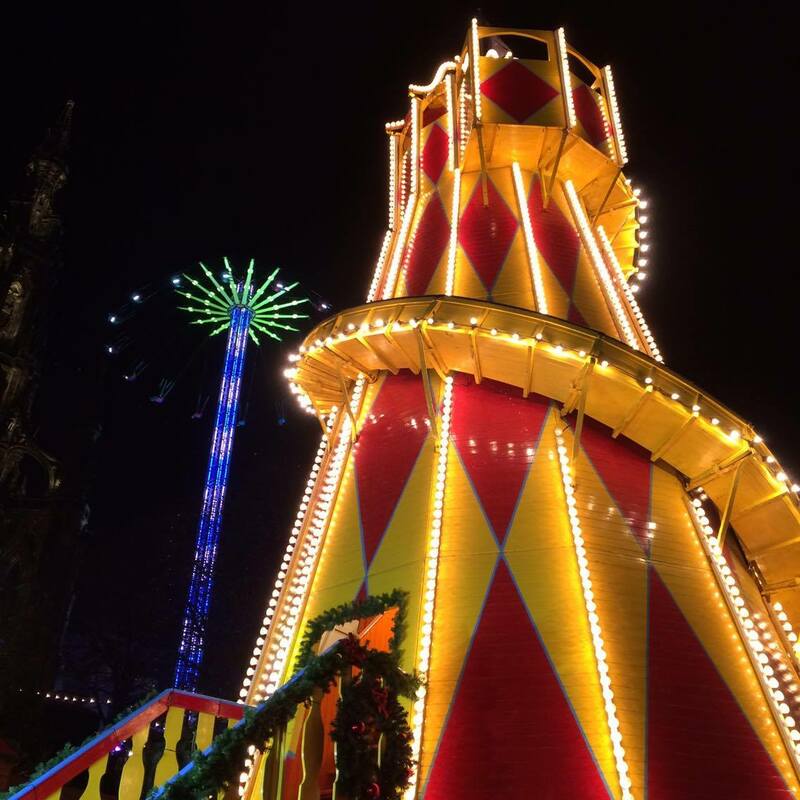 This weekend I went to see the Light On festival in Edinburgh, celebrating the start of the Christmas season, and lighting up the city in a magical way. 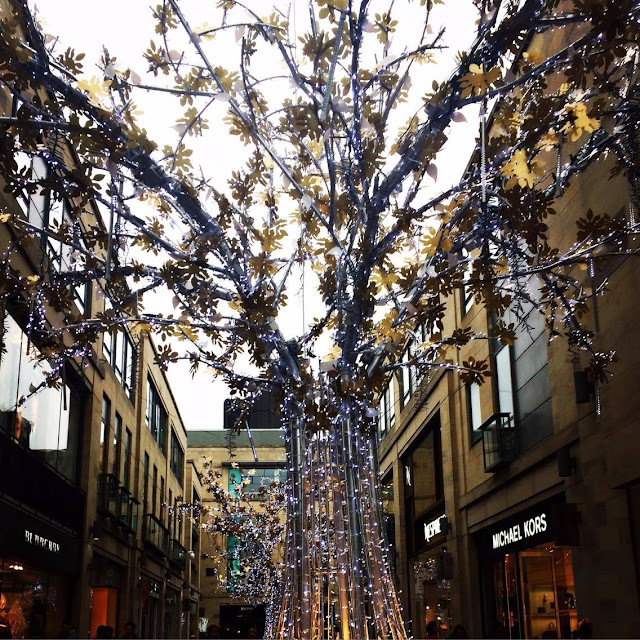 This made me start to think about what a great place Edinburgh is to celebrate Christmas in, so I thought I'd share my top 5 things that you should do while in the capital at this time of the year. So crank up Michael Buble, grab a hot chocolate and snuggle under a blanket as you fantasise about these festive outings. My home away from home - the Christmas market is the best thing when it comes to town. Wooden stalls filled with beautiful hand crafted decorations, jewellery and of course, lots of food. The smells of both the pine christmas trees and the bratwursts cooking will fill you with cheer. Its impossible to resist a Chocolate Kiss or a hot toddy to warm up your collywobbles. I could - and do - spend hours ( read days) at the market, exploring all the stalls. For kids (and adults who still class themselves as kids) there's Santa Land - an area filled with kid friendly rides, a christmas tree maze and Santa's Grotto. And for those with a little more courage, there's the Star Flyer and the Yeti to really test your bravery. It's everything that Christmas dreams are made of, with Christmas music blasting out of speakers all around. The only thing I could wish for would be snow to top up this wonderland. A new addition to the Christmas scene last year, the Street of Light is one of the cbest things to do in the evening. Pull on some extra layers, and maybe take a flask of hot chocolate to keep you warm, and head to George Street to watch a beautiful display of lights to music. You'll need to book your tickets first, and choose between the different fantastic choirs that fill the street with carols and songs alike. Whether you stand underneath the structure, or beside it, you'll be amazed by the lights synchronised to each song. It's truly wonderful to see - I already went along last year, and have booked twice to see it this year! I love this concept - you get to go and visit places around Edinburgh that are normally closed to the public. The '24 Doors of Christmas' gives you a chance to sneak a peak in places you wouldn't normally get to see. Each day there's a different door open, so depending when you're visiting the city, or if you're here for the whole festive period, you'll have the rare opportunity to explore some new places. I don't know about you, but the Secret Herb Garden sounds pretty enticing to me, or maybe pretending you're in a warmer climate at the Temperate Palms House at the Botanic Garden. Check out all the options on the official website. Not only does the Street of Light brighten up the city centre, you'll find festive touches all over the city. The Dome always creates a beautiful display of wreaths, and Multrees Walk keeps everything very classy and sparkly - echoing the higher end shops in that area. You could even take a walk up the mound to see the Christmas Tree, gifting from Norway - a massive tree covered in thousands of lights, what could be more Christmassy? 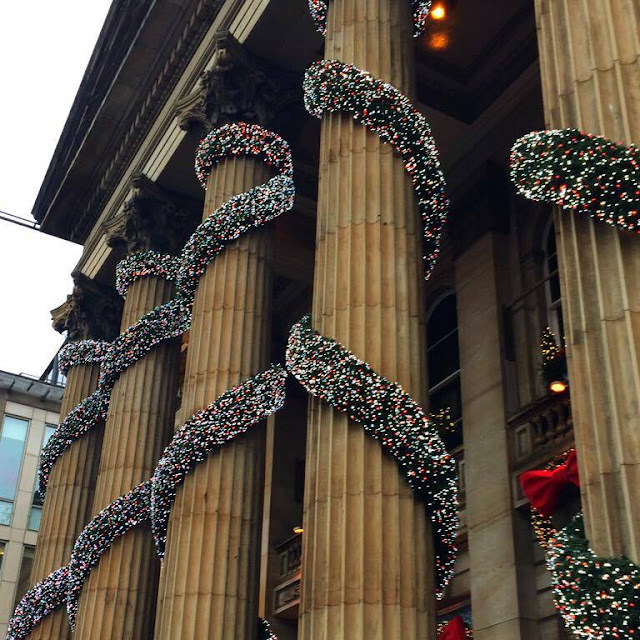 The whole of Edinburgh truly embraces the season, with The Caledonian covered in lights, and the arches twinkling even during the day, and Victoria Street becoming even cuter (if that's possible). It's worth spending some time wandering around the streets to see all the lights, trees and decorations, and in no time you'll feel super Christmassy. Pantos are a huge Christmas tradition for many families, and this year Jack and the Beanstalk has come to town. Prepare for an evening filled with laughter and smiles. Filled with traditional panto jokes, and some twists on the classic fairy tale, pantos are one of the best places to go to feel Christmas cheer. Whether you're a kid or an adult, you'll find enjoyment at the panto - a perfect place for families to go and spend time together, while not freezing your toes off outside! What's on your Christmas list this year? Make sure you're following me on instagram to keep up to date with all my Christmas outings! 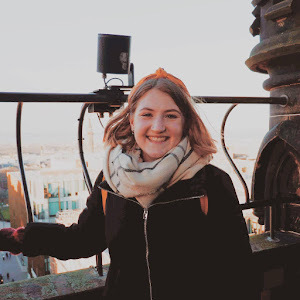 Check out my favourite places to visit in Edinburgh in the Autumn too!